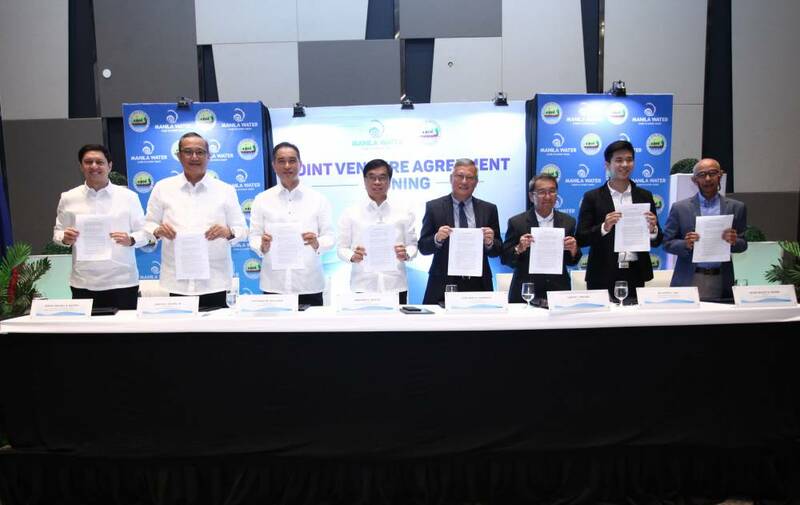 Manila Water consortium signs joint venture deal with City of Ilagan Water District | Manila Water Company, Inc. In photo (from left): Head of Manila Water Philippine Ventures (MWPV) North Luzon Regional Business Development Robert Baffrey; MWPV President and CEO Virgilio Rivera, Jr.; Manila Water Company Inc. President and CEO Ferdinand Dela Cruz; Filipinas Water President Abelardo Basilio; City of Ilagan Water District (CIWD) General Manager Jose Mari Claravall; CIWD BOD Chairman Joseph Paggao; Ilagan City Councilor Jay Eveson Diaz; and Joint Venture Selection Committee Chairman Oscar Rivero. Filipinas Water Holdings, Inc., (Filipinas Water) a consortium of Manila Water Company Inc. and its wholly-owned subsidiary Manila Water Philippine Ventures, inked a partnership deal with the City of Ilagan Water District to implement the development, construction, operation, and maintenance of bulk water supply with system expansion and septage management project for the water district operating in the City of Ilagan in the province of Isabela. Under the agreement, a joint venture company shall be formed where Filipinas Water shall own 90 percent and the City of Ilagan Water District shall have 10 percent of the outstanding capital stock. According to City of Ilagan Water District Chairman Joseph Paggao, the partnership intends to resolve challenges in water quality, water pressure and service coverage in order to provide clean and adequate water supply as well as proper septage management to 91 barangays of the city. In his speech during the signing event, Ilagan City Councilor Jay Eveson Diaz expressed his high hopes, highlighting that the partnership will benefit about 170,000 residents and will boost the economic competitiveness of the city. He stated that he and the water district are looking forward to more opportunities in extending the provision of services to all barangays of Ilagan. Meanwhile, Manila Water President and Chief Executive Officer Ferdinand Dela Cruz said that the consortium is committed in investing and delivering the needed projects for the city. He added that this partnership attests to how collaboration between the local government, the private sector, and the water district can work in resolving the water and environmental problems that confront many places in the country.